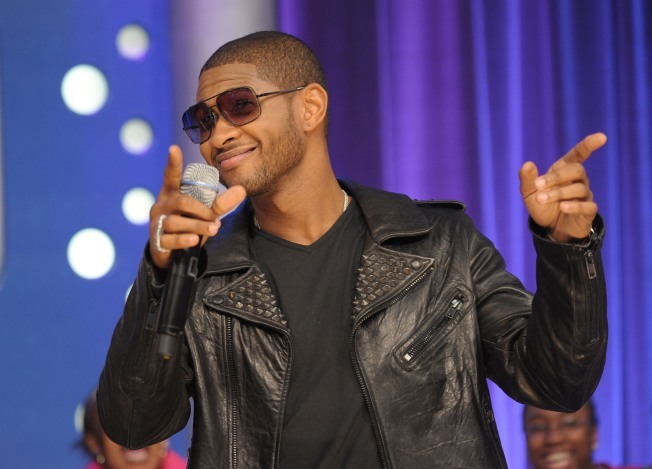 Usher Inspires a Night of Improvement on "Idol"
Singer Usher brought out the best in "Idol" hopefuls. “American Idol” has solved the problem of what to do when Simon Cowell leaves at the end of the year, and it has nothing to do with who takes his place on the platform. Just make Usher the permanent mentor, and the singing will be good enough that nobody will notice the caustic judge is not there. This week’s guest was the anti-Gwen Stefani in his ability to inspire everyone to be at their best for soul and R&B night. Maybe when he looked into each of the 10 remaining finalists’ eyes, the gaze pierced their souls and caused them to finally understand. Maybe his words just clicked, and everyone took his advice to heart. Or maybe his very presence was enough to trigger top performances. Whatever it was, it worked. With the exception of a few disappointments — I’m looking at you, Siobhan Magnus — everyone came through on Tuesday. First of all, the obvious. Crystal Bowersox was great as always. The big change that she talked about last week was that she was on the piano instead of the guitar, but she could have played the pan flute and still rocked out on “Midnight Train to Georgia.” And who didn’t love those stilettos? Also unsurprising: Michael Lynche. Randy Jackson gave him credit for returning to his sentimental side in singing “Ready for Love” by India.Arie, which begs the question of when exactly Lynche has been anything other than Mr. Sensitivity this season. It was really good and he’ll still be here a month from now so there isn’t much drama. Casey James came onstage with his guitar and sang “Hold On, I’m Coming” by Sam and Dave and was his usual charming but surprisingly forgettable self. Assuming his female fans revived in the 90 minutes that elapsed between his performance and the start of voting, he’s in good shape as well. Let’s move on to the two surprises who made everyone on Twitter tweet “About freaking time!” when the singers were done. Lee Dewyze was apparently performing with walking pneumonia, but the “If you don’t believe it, they won’t” tip from Usher was as good as antibiotics for his health. Dewyze’s “Treat Her Like a Lady” was by far his best performance yet, and Simon declared it the moment Dewyze’s life may have changed forever. Here’s hoping, because if he can keep playing like that he’ll be around to the finish. But nobody — nobody! — needed a strong performance as bad as Andrew Garcia. The judges had lost all patience with him, and he’d have been the top choice to go home with another clunker. Instead, he sang “Forever” well enough that it might actually get Chris Brown back on the radio. And if that wasn’t enough, Andrew’s mother came onstage to smack Simon down after the judge called her son boring. Would you want to answer to her if you didn’t vote to keep her baby in the competition? Didn’t think so. The kids were mostly alright, though they prompted some irrational optimism. Randy Jackson called Katie Stevens “like a young Christina (Aguilera)” after she finished with “Chain of Fools,” at which point Simon and most of the viewers wondered if Randy had forgotten to take the iPod out of his ears while she was onstage. Later, Aaron Kelly was fine closing the show with “Ain’t No Sunshine When She’s Gone,” but Simon said there was absolutely no chance he would be going home this week, and he didn’t do well enough for that large of a vote of confidence. He’s definitely not who I would choose to go, but I could see it happening. Start with Siobhan, who had her first truly bad performance with “Through the Fire.” She never got the song under control, and even though the judges gave her every possible bit of encouragement — “Every performer has an off night, and you’re entitled to one,” Kara DioGuardi said — she lost a lot of ground to the leaders. But the two most likely to be in danger areDidi Benami and Tim Urban. Benami earned no raves with “What Becomes of the Brokenhearted,” though at least she managed not to break down like she did in rehearsal. Tim was utterly soulless on his “Sweet Love” by Anita Baker and would be the obvious pick to go, but they call him “Teflon Tim” for a reason. And by “they” I mean Ryan Seacrest. If Tim makes it smiling through another results show, he’ll prove himself to be the best escape artist since James Bond.